“We do get some strange requests” proclaimed the taxi driver as he handed over the goods, his cab pulled over on a narrow farm track. His passenger: a tube of Ibuprofen Gel, conveyed carefully to us from the nearby town of Wantage. One of the occupational hazards of long distance walking is mid-walk injury. The weight of rucksacks; the pounding of feet on hard surfaces; the ups and downs of hills; they can all take their toll on the human body. For us, it is usually the knees which suffer the most. Catherine had noticed her knee was feeling a bit dodgy the night before, but as I rummaged through the first aid kit, something was decidedly missing. Ibuprofen gel is almost like a miracle cream in such situations. Rub a little in and almost instantly swelling and pain disappears. As such there’s always a tube stashed away alongside the plasters and bandages. Well, I say always. It was notably absent this time, and as I rifled on in despair, an image suddenly came to my head of the tube sat next to the scales on the kitchen worktop at home. And so as I paid the pub landlord (and he told me of the many local pubs closing down, and how Sharps brewery weren’t answering the phone when he wanted to buy beer off them), Catherine gave the local taxi company a ring to see if they could meet us somewhere with a tube of gel. At a £10 delivery cost, it perhaps wasn’t the cheapest way of getting the stuff, but it certainly wasn’t the slowest either. The sky was bright blue as the taxi driver sped off to pick up his next fare, and there was a joyous feeling in my heart as we headed back up the ridge. The weather was putting me back in a good frame of mind, which was much needed after being kept awake by the people in the room above us. Goodness knows what they were up to the night before. They seemed to have an excitable kid who was still yammering on at midnight; the voices coming through the walls. And until around 10:30, our room was filled with the gurgling noises of what I can only assume was a washing machine in mid cycle. The kid had started up blabbering on again bright and early at 6:30am, and someone was very keen on slamming doors an hour later. Joy. Still, at least there was breakfast – we’d been given the choice of the inclusive continental breakfast, or adding in a cooked element for £5. Wary of time and waistlines, we’d opted for continental which turned out to the choice of cereal and a glass of orange juice. Sorry, but on what planet is that a continental breakfast? Cereal is a huge part of the modern British breakfast. In fact, according to a Euromonitor report in 2003, the UK is the second biggest consumer of breakfast cereals in the world. The only way cereal can be a continental breakfast is if your continent is North America. A croissant, or some bread and cheese, now that’s continental. Cereal most certainly isn’t. And after all that, we only got out about ten minutes earlier than we normally would anyway. But at least the sun was shining. And we’d saved £10. And the digestion of a couple of hundred calories. For some reason, the climb back up to the Ridgeway seemed much easier than it had coming down off it the night before, the inverse of normality proving to be an illogical conundrum that I puzzled over for the whole of at least thirty seconds. But back up there, it was time once more to take in the sights that being up on the highest hill for miles, doth provide. A short walk from Sparsholt Firs brought us to the Devil’s Punchbowl, one of four which litter England’s landscape. 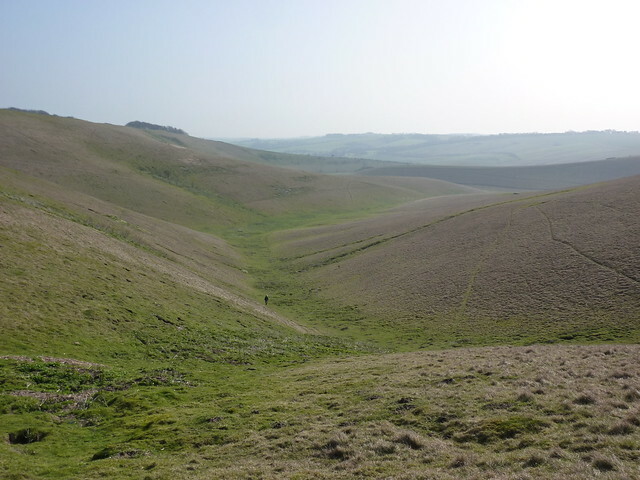 From the Ridgeway itself, little is actually viewable; however a path leaves the trail and heads off into the Punchbowl. We walked along a short distance in order to take in the view, stopping just before the path took a definite downwards direction between the two slopes, looking almost as if millennia of walkers had trampled a deep groove into the hill. The next sight was the remains of yet another fort as we walked by what the Ordnance Survey rather indecisively call “Segsbury or Letcombe Castle”. 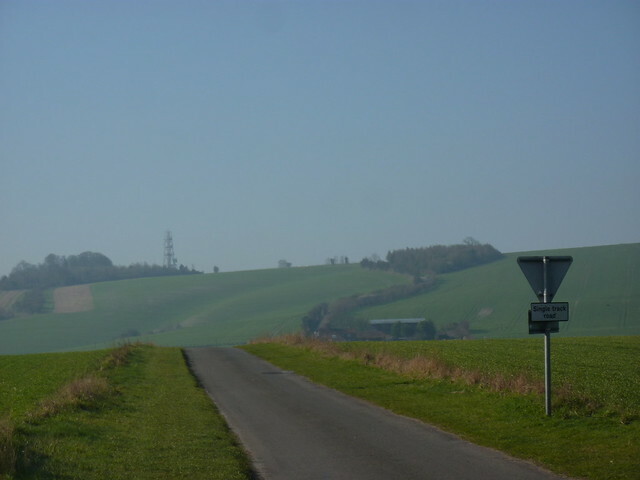 With ramparts following the Ridgeway for about a quarter of a mile, it no doubt offered yet more fine views of the area – far finer than the Ridgeway itself which was now surrounded by trees. Yet there seemed no way to actually get on to the castle site, and having already done several hill forts already, there seemed little point in tramping over yet another set of grassy lumps trying to imagine what must have once stood there. 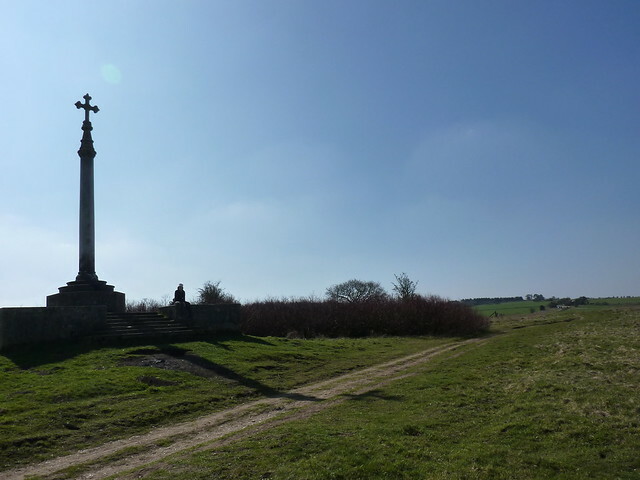 Perhaps that sums up the Ridgeway: so much history that you ultimately lose interest in it, at least until you find some different aspect of history. At Betterton Down we found something a little more recent. A tall cross-topped monument stood; its marble column glimmering in the sun. It was built to commemorate the life of Robert Loyd-Lindsay, Baron Wantage, born in 1831, dying in 1902. A close personal friend of Florence Nightingale, the Baron served in the Crimean war, was an MP for 20 years and developed the extensive Lockinge estate, for which he is perhaps best known locally. 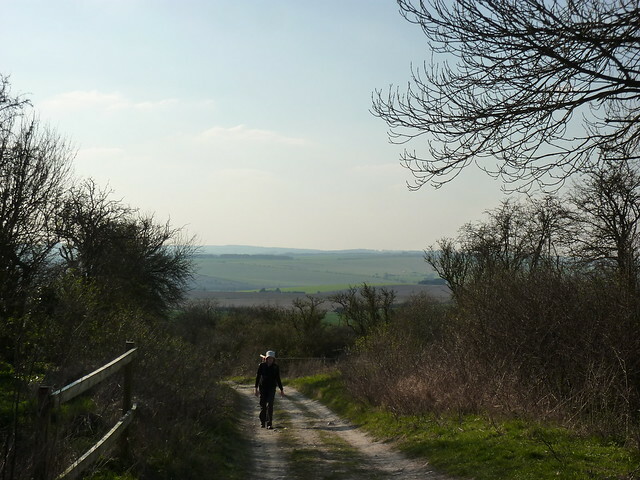 Whilst the Ridgeway has a lot of history that you may begin to ignore, it has plenty of roads that you really shouldn’t. Every couple of kilometres the path would cross another main road going north to south, reminding the walker just how much tarmac covers the country. At each road crossing, a small car park and the odd car parked up, usually for the many dog walkers. The local dog of choice was undoubtedly the black Labrador, usually with three dogs to a walker, all bounding around happily in the morning sun. Every now and then, someone would break the mould and own a terrier or even a border collie. It was a collie that now greeted us as we rested next to yet another car park on Bury Down. It wasn’t the dogs that stole the show however. During the day we’d seen a fair few red kites, and we’d managed to “drove” one from bush to bush. Every time it settled on a tree, I tried to whip out my camera and get a good shot of it. 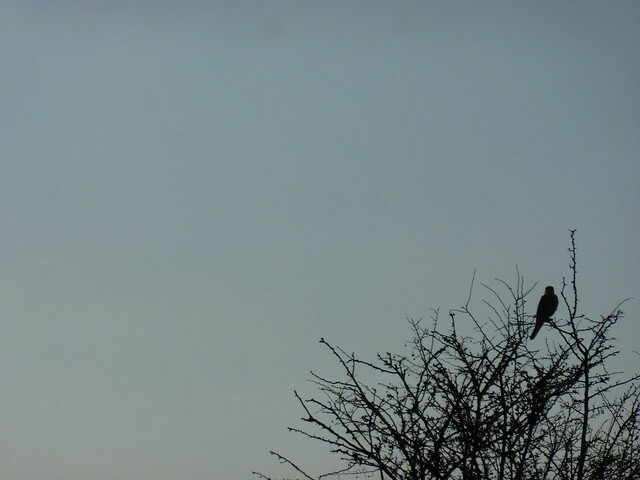 Just as I had it lined up neatly in my camera, it flew on a few metres to the next bush. Sighing, we’d walk on and try the whole process all over again. In the end I gave up and decided to try taking pictures of things that didn’t move. Main roads can be the scourge of the walker, however thankfully the busy A34 would be the last one for quite some time, and someone had had the foresight to build a tunnel under it for the benefit of walkers. Tunnels under roads are rarely nice places. Usually dimly lit, with either smashed or malfunctioning lights, even in the most rural location they have a habit of being covered in graffiti and having a rather dubious smell. This one was no exception, however some kindly soul had taken the decision to “liven it up” by painting a mural of local sights in both the Neolithic and modern era on one wall, leaving the other blank for the inevitable spray can brigade. Naturally the vandals had not taken the hint, and had instead decided that their scrawling of “Wozza” would look far better if done over the head of a Bronze Age farm worker. What filled me even more with despair was the sheer effort Wozza and his cohorts had gone to. Here was a tunnel with no road access, miles away from the nearest town. Yet a group of vandals had somehow known about the place, made their way here and sprayed a concrete wall for the benefit of goodness knows who. After all, the chances of their peers seeing it and being impressed, must surely have been low. Whilst much of the local countryside was once sheep rearing territory, now a lot of it is reserved for different beasts. The Ridgeway had already taken us along side many gallops for racehorses, often running parallel to the track for long distances. However, popping out from under the A34 saw us enter a landscape almost entirely given over to it. A plethora of grassy runs with narrow fences filled the views for miles around, although the only creatures running whilst we were there were a group of school kids looking less than impressed to be running around in the heat of the afternoon. By the thirsty looks on their faces, they may have been hoping to rehydrate at the nearby drinking water tap but if so, they would be sorely disappointed as, like its counterpart near Sparsholt Firs, it was quite broken. The Ridgeway took us over another dismantled railway. Closed in 1962, the former trackbed of the Didcot, Newbury and Southampton Junction Railway was living proof of how quickly nature can reclaim from man, even if man had decided that driving up to a remote former railway line was a far better way of dumping old fridges and microwaves, than taking them to a proper disposal site. One can only wonder what future archaeologists will conclude when they find remnants of railways mixed up with cooking equipment. Leaving the railway behind, we passed into Oxfordshire and the Ridgeway was once more hidden from the views as it went along another tree lined track, with the odd farm building visible in the distance. By now we were feeling a little weary; almost desperate to finish, our legs not having had much recent experiences of the long distances we needed to do. Slowly, but surely we reached the end of the track and met up with the more defined road that would take us the final three miles into the twin-villages of Streatley and Goring. After spending three days wandering around relatively empty locations, the Ridgeway suddenly entered modern civilisation as it entered the hamlet of Thurle; large houses sitting on each side of the road, daffodils blooming happily in their gardens. Cars began to appear, whilst at one point a Royal Mail van hurtled towards us at an unnerving speed. 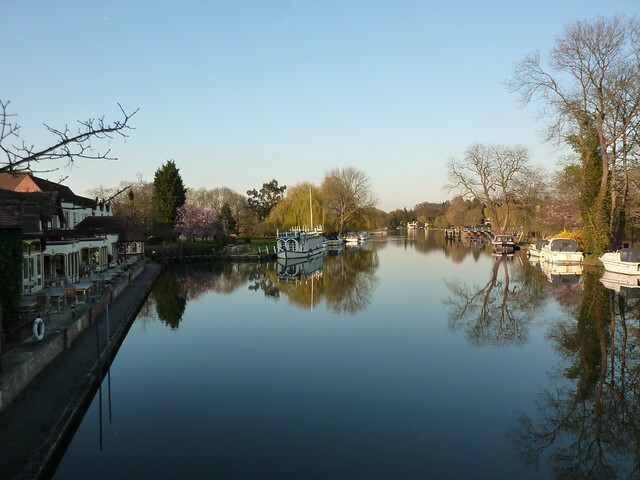 Soon the road led us on to the busy A417 and we made our way, stiff legs, aching bones and all, through Streatley, over the River Thames and into Goring. Our accommodation for the night was our own home; our first three days on the Ridgeway now at an end. The train station seemed to be an age away, tucked away at the far side of the village; its platform being inevitably being used as a teenage hangout and skatepark. Boarding the train, packed with commuters from Oxford and its nearby environs, we headed to Reading to catch our train home, half of the Ridgeway now done. First Published: 2 May 2011. Last Updated: 16 November 2014.